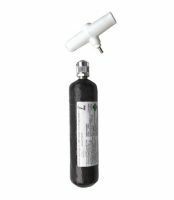 We provide the full range of ABS Avalanche Airbags products Including airbags Base units, Zip-ons, ABS backpacks, Steel Canisters, Carbon Canisters, Canister Refilling Options. All products can be purchased separately. If your looking for the older vario base unit range then please head over the Sales and Clearence Category where we have discounted offers. 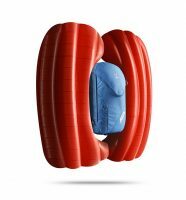 The ABS Avalanche Airbag is an intelligent system used to prevent complete burial in an avalanche and to survive the accident as unharmed as possible. The rescue concept: with one pull on the activation handle of the backpack two airbags will inflate in mere seconds to a total volume of 170 litres. This additional volume will likely prevent the burial of the carrier. Gas from a cartridge contributes to the airbag filling. Of course, the ABS Airbag can be re-used after activation. The cartridge, as well as the activation handle, can be re-filled. 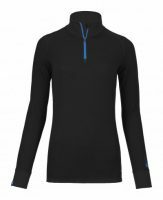 98%* off all avalanche victims with activated ABS-Avalanche Airbag survived nearly unharmed. 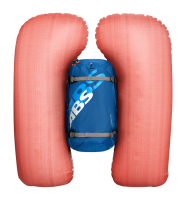 History of ABS Avalanche Airbag and how they have evolved. When you see an avalanche approaching, you pull an activation lever which instantly fills two airbags with 170 litres of gas via a cartridge within your backpack. 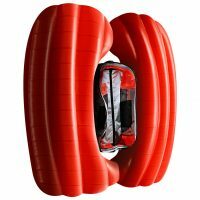 This aids buoyancy and makes it unlikely that the user will become buried under snow. 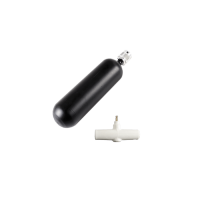 When you pull the activation handle, this releases pressure that causes a pin to pierce the gas cartridge. The gas then fills the airbags, with suction and release valves taking in air from the surroundings to aid inflation. It takes just two seconds to inflate both airbags to a total capacity of 170 litres. 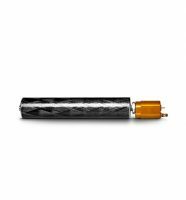 The airbags are made from nylon polyurethane and the gas cartridges are made from either carbon or steel. How do the base unit and ABS backpacks work? The activation handle is attached to the left or right side of the shoulder straps which connects to the airbags. 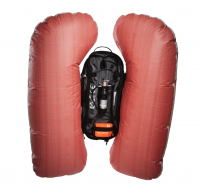 The airbags fold away into two pockets on either side of the unit. They are connected to the cartridge with an inflated tube which is housed at the top of the unit. The full cartridge screws into the housing. The base unit can zip onto backpacks of varying sizes. How to fold the airbags back into the pack after activation? Each airbag has a suction and release valve. After inflation, you lift the cover of the valve and press down on the red button to fully deflate. The airbags will then fold away back into the pockets ready for re-use. ABS Airbags are generally permitted on all flights, however, it is recommended that you check in all of your equipment and inform your airline at least 14 days before departure, its mostly recommended to store it in the hold. What to do with used empty canisters? What other brand‘s backpacks are compatible with the ABS base unit? 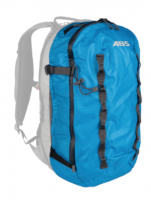 Only ABS brand backpacks are compatible with the ABS base unit. Avalanche rescue backpacks are listed as restricted goods but with prior approval, it is permitted to fly with the backpacks and their accompanying gas cylinders. The current IATA regulations permit one backpack, with accompanying cylinder and activation handle, per passenger. Inform your airline that you are travelling with one "avalanche rescue backpack" as allowed in the IATA regulations table. Ask them to confirm, via email (print off a copy of this and take with you when flying). Print off two copies of the IATA table 23A 2011: put one copy with the airbag and carry the other with you along with your other documents. Pack the airbag appropriately and check it in as hold luggage. Ensure that the cylinder and or triggers are not attached and that the cylinder has its cap on. Although the regulations say an airbag may be permitted as hand luggage, we advise not doing so as there have been problems reported attempting this. You may be called to explain the item, so allow a little extra time for this. If normal security gives you any difficulty ask to speak with a manager. Follow this link to the Current IATA regulations regarding carriage of dangerous goods Print this out and take it with you to the airport. Both ABS and Snowpulse offer advice on their websites for flying with their avalanche bag system. Avalanche rescue backpack, one (1) per passenger, equipped with a pyrotechnic trigger mechanism containing less than 200mg net of Division 1.4S and less than 250 Ml of compressed gas in Division 2.2. The backpack must be packed in such a manner that it cannot be accidentally activated. The airbags within the backpacks must be fitted with pressure relief valves.